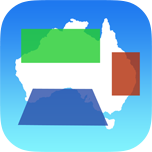 CultureMap is the mobile app for the Cultural Atlas of Australia, a digital atlas that maps the locations of more than 200 films, novels, and plays that feature Australian spaces and places. You can use the CultureMap app to find narrative and filming locations near you, you can search for your favourite Australian stories to find out where they are set, or you can search by location to discover what stories have been set there. The app also features our Mapping Ecological Themes showcase, which focuses on films and novels that foreground ecological themes or are set in environmentally sensitive areas. CultureMap is co-funded through an Australian Research Council Discovery Grant and an Inspiring Australia: Unlocking Australia’s Potential grant. CultureMap is available for iPhone and Android™ devices.